What was your favorite part of the Charm City course? Myerson: Funny, I can’t come up with a single section that stood out as “favorite.” The course was so relentless, with a lot of rhythm changes and challenges. We had pretty much everything but mud. 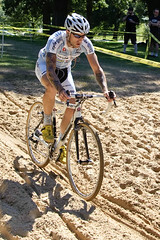 Myerson dials in the sand section during his warm-up. I suppose the sand section would have stood out if I had ever been able to ride the entire section like I had in practice. The climb leading in to it really zapped you, and I always felt faster running. Myerson: There were two clear moments where the race was made. First, when Davide Frattini crashed, it was the opportunity I was looking for and I had to exploit it. In the end, with 3 laps solo while other riders chased and Davide was able to ride from group to group back up to us, it probably hurt me for the finish. The second moment was when Davide attacked with a lap and a half to go. I was waiting for it and ready, but I simply could not hold his wheel over the small climb leading up to the pit. There was a lot of open riding after that section, so once we were separated, Mike Garrigan and I could not close the gap back down. That’s where Davide won the race. Myerson: I do not eat special food on race day. Ideally I eat the same breakfast every day, which is typically GoLean Crunch cereal with bananas, chocolate chips, and soymilk. If I’m traveling or eating out, I’ll normally have some kind of fruit pancakes. I try to be done eating at least 3 hours before the start, and I arrive anywhere from 2-3 hours before the start, depending on when the warm up window on the course is. I try to make sure I get two sessions on the course, at least. In the first session I ride one lap of the course easy to look at it, and then start taking laps at speed, or re-riding sections that need a little more thought. I try to get at least one full lap close to race pace. Then when the women’s race starts, I go back to my car, eat an energy bar, pin my number on, change my clothes, make any final adjustments to tire pressure or bikes, and try to be back on my bike 15-30 minutes before the start. One more lap with a few minutes at race pace, and then go to the start line. If it’s raining or muddy I’ll ride the trainer for that second session instead of going back on the course. Myerson: Don’t worry what place you’re in. The great thing about ‘cross is that you can show up with whatever form you have and not worry about staying with the pack. Finishing on the lead lap of your race is real accomplishment, and your focus should be to race yourself as much as the people around you. You don’t have any control over how fast they’re going or how much they’re training. But are you sprinting out of every turn? Are you resting before transitions? Things like that. Focus on putting in a strong, intense 30 or 45 minutes, and then go from there. Myerson: I’m lucky enough to be sponsored by Williams Cycling, and am riding their alloy ‘cross tubulars, as well as a set of carbon 38’s. I have 6 sets of alloy tubulars with 2 sets each of 32 Grifos, 34 Grifos, and 32 Fangos. On the carbon 38’s I have a set of 32 Grifo XS file treads. The carbon rear wheel is also built up on a PowerTap hub courtesy of Saris, so I can collect data in the faster, dryer races where I’m not changing bikes. For training I have 2 sets of Williams 30 clinchers with PowerTap hubs, one with road tires and one with ‘cross tires. The Elite Men leaders kicking up some dust. Myerson: Well, when Davide crashed it was certainly notable. I was leading through an off-camber turn just after the start of the lap, driving things a little. Davide must have taken a slightly different line than me, and it sounded like a bomb had exploded behind me. I almost groaned because I knew I had to take advantage of the situation, but I was not positive I could ride the rest of the race alone, when the course was so conducive to drafting and group riding. Just before I was caught, Tyler Wren jumped across by himself, and started leading. But as we came into the sand section, he attempted to ride it, and got himself off the fast line. I ran by him along the tape, but when he regained control and tried to straighten himself, he came back into the line I was running. I had to flick him off with my elbow to keep us from tangling, and I never saw him again after that point. I don’t think he was pleased. It’s also memorable or notable that the two riders who looked to be doing most of the chasing to bring me back didn’t finish in the top 5. Myerson: Only to say that it was my first time at Charm City, and it was an exceptional course. I can’t remember the last time I had to get off my bike 4 times a lap on a dry, fast course with only 1 set of planks. Natural sand, a short retaining wall, stairs, a set of barriers – all that combined with a long stretch of pavement, difficult washed out turns, off-camber grass, short, steep climbs and descents – it was one of the most complete courses I think I’ve ever done. Myerson: I have more than one. First to Chris Nystrom for being the contact for me for Charm City, and helping me out by arranging free entries for the weekend, host housing, airport transportation, and beer. Heidi von Teitenberg hosted me, and was incredible. She picked me up and dropped me off at the airport, drove me to the race both days, cooked breakfast and dinner, made vegan cupcakes, and loaned me a bike on Monday. All while volunteering at the race and racing herself. 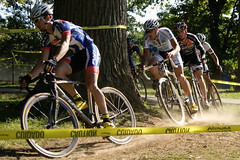 Finally, Matt Roy and Mo Bruno Roy transported my ‘cross bikes and wheels from Massachusetts down to the race. Matt worked the pits for me after taking care of Mo, and then they took my gear back to Mass so that I didn’t have to fly with bikes to Las Vegas (where Van Dessel had my new bikes waiting for me). Because this trip involved crits and ‘cross races, there were a lot of logistics to sort out, and I couldn’t have done it without their help.